Created as a piece of art, a ‘snap shot’ of Old Town as it is today. Also see the map of the town centre (today) and how it was in 1968. 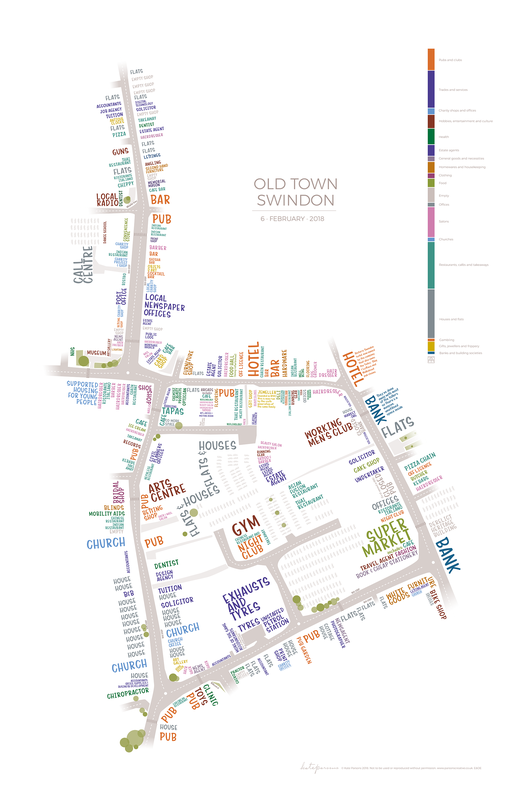 Both Old Town and the town centre’s largest category is places to eat and takeaways, with trades and services (including estate agents, marketing, plumbers and solictors) the second biggest category. Just under 5% of the shops are empty (compared to 14% in the town centre). A copy is on display at The Core, Devizes Road where you can also buy a copy. Signed prints, 90cm x 60cm, on good quality 180gsm paper, £28. Available for sale at The Library Shop, Regent Circus. Copies can also be viewed at the Library’s Local Studies department. Custom versions are possible! Email kate@parsonscreative.co.uk or call Swindon 420938 for a chat.